As many of us have heard, Gregg Popovich of the San Antonio Spurs was named the 2013-14 NBA Coach of the Year. This is the 3rd time he’s accomplished the feat – joining Don Nelson and Pat Riley as the only coaches to do so. But how did he win this one? If you don’t know how the voting works, 124 members of the NBA media submit ballots with a 1st, 2nd and 3rd place candidate. A candidate receives 5 points for a 1st place vote, 3 points for a 2nd place vote and 1 point for a 3rd place vote. Voting members include newspaper beat writers, TV sports talk-show hosts, color analysts and play-by-play announcers. 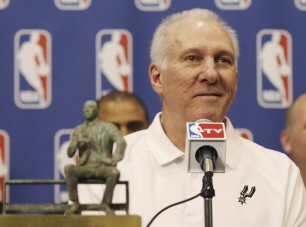 Popovich finished with 59-1st place votes, 23-2nd place votes and 16-3rd place votes for a total of 380 points. Of the voting members from San Antonio, Mike Monroe from the San Antonio Express-News was the only one to not place Popovich 1st on his ballot. Monroe placed “Pop” 2nd behind the Phoenix Suns’ Jeff Hornacek (Hornacek finished 2nd in the stadings with 339 points). The other San Antonio voters were Bill Land, play-by-play commentator for Spurs Television, Bill Schoening, play-by-play commentator for the Spurs on the radio, and Jeff McDonald from the Express-News. Glenn Consor – 106.7 The Fan, Washington, D.C.
Steve Buckhantz – Comcast SportsNet, Washington, D.C.
Hornacek was only left off of 21 ballots (click here for the official results from the NBA). 3rd place in the voting was Tom Thibodeau of the Chicago Bulls with the Charlotte Bobcats’ Steve Clifford in 4th. Not receiving any votes were Miami’s Erik Spoelstra and Indiana’s Frank Vogel. Three coaches all finished with 1 point – Scott Brooks from Oklahoma City, Mark Jackson from Golden State and Jason Kidd from Brooklyn. While this season’s Coach of the Year results are quite plain and simple, what remains to be seen is how long Popovich will continue to coach the San Antonio Spurs. If he continues much longer, there is a chance he may become the first coach to win a 4th award. ← ESPN: Did They Start a Trend? Or Simply Hop on Board?